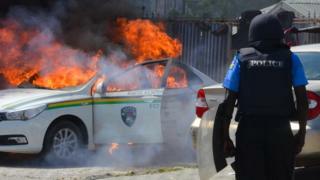 Nigerian police have arrested 400 members of a Shia Muslim sect after days of deadly protests in the capital. The pro-Iran Islamic Movement of Nigeria (IMN) protesters demanded the release of their leader Ibraheem Zakzaky, in custody for 34 months. The army admits that three people were killed in clashes in Abuja on Monday, but the IMN says that dozens died. In 2016, a judicial inquiry found that the army had killed more than 300 Shia Muslims during clashes in the north. It accused the army of using "excessive force" when trying to head off an alleged attempt to kill army chief Gen Tukur Buratai in Zaria, Kaduna state, in December 2015. IMN leader Sheikh Zakzaky was arrested in the aftermath and held without charge until April 2018 when he accused in court of inciting violence. No soldiers have been arrested, despite the judicial inquiry advising prosecutions. The army, which fired live rounds on Monday at the protesters, said the deaths came after the demonstrators tried to overrun a checkpoint. The security forces also accuse the Shia protesters, who took to the streets of the capital for three days, of having 31 petrol bombs as well as other dangerous weapons. Sunni jihadist group Boko Haram condemns Shias as heretics who should be killed.